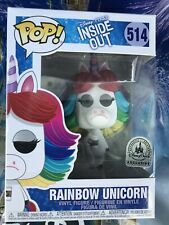 Funko Pop Disney Parks Exclusive : Inside Out Rainbow Unicorn #514 Vinyl "MINT"
Funko Pop #514 Rainbow Unicorn Inside Out Disney Parks Exclusive New In Box! Funko Pop Disney Inside Out Rainbow Unicorn Disney Park Exclusive 514 In Hand! Funko Pop Inside Out Rainbow Unicorn Disney Parks Exclusive In Hand!! This page was last updated: 22-Apr 19:41. Number of bids and bid amounts may be slightly out of date. See each listing for international shipping options and costs.